Eye of the Storm by Kate Messner. Walker/Bloomsbury, 2012. Currently available. Genre: Middle grade speculative fiction/mystery. Face Value: This is an excellent middle grade cover. One of its immediate standout qualities is that a human, not a computer, created it. In the landscape of increasingly digitally manipulated book covers, an honest-to-goodness illustrated cover is refreshing. The menacing storm that looms large in the background forecasts the action and tension that makes this novel such an engaging read. I like that this cover feels very appealing to a wide range of readers. Boy and girl readers will both be intrigued by this cover. That’s a good thing – get this book into as many hands as possible. It is fantastic. Does it break the slate? This book is a Slatebreaking role model. Not only is the young protagonist a Slatebreaker, but there are also no fewer than three – three! – prominently featured adult female Slatebreaking characters. In Jaden, the narrator of the story, Kate Messner has hit just the right note of early adolescent curiosity, self consciousness, and longing. Who would we give it to? Girls with an intense sense of curiosity. This book is all about investigating and finding answers. Jaden digs deeper into a scientific challenge as well as her own family history and her sense of self. Review: If you work in education or youth programming, you are probably familiar with the clamor over STEM-based education. Corporate sponsors go nuts for curriculum rooted in science, technology, engineering, and math. The educational zeitgeist focuses on getting US American children up to speed in these subjects so that they can compete on the world stage in a rapidly globalized job market. As someone who works in education, I see the value of STEM programming. As someone who also has two theatre degrees and an inclination for the arts, I often wonder how future scientists/technicians/engineers/mathematicians can thrive if they do not also have creative thinking skills. I’m a big fan of STEAM – science, technology, arts, and math. 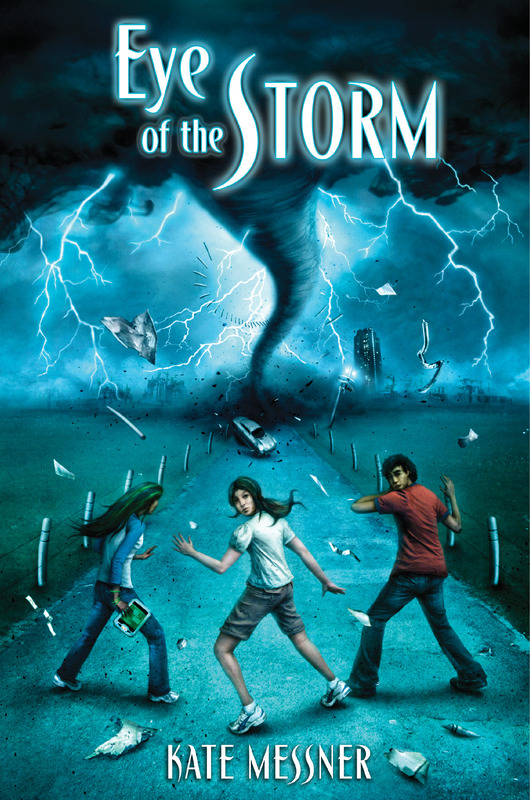 Kate Messner’s novel Eye of the Storm fits perfectly within the push toward STEM education. It features young people wrapped up in a highly scientific mystery. The story is set in 2053, in a version of the United States that has suffered greatly from climate change. Tornadoes ravage the landscape weekly. Storm severity has increased so much that the previous scales for measuring intensity and speed have had to be revised to accommodate the unprecedented destruction. Outdoor pursuits like bicycling or leisurely strolls are no longer an option, because you don’t want to be stuck outside if a sudden storm hits. Storm shelters are the norm, with children learning at a young age to run for safety when the sky darkens and the winds pick up. Schooling is primarily digital because it’s not always safe for kids to be traveling back and forth to a school building every day. The only safe place is Placid Meadows, a planned community created by the StormSafe corporation. The company provides an Eye on Tomorrow science camp for the brightest young minds and mysteriously but effectively insures that families living within the gates of Placid Meadows are safe from storms. Although there are many familiar elements about the way people live in Messner’s version of the future, there is a troubling sense of constant fear that permeates their lives. They always have to be ready to find safety when a storm hits. The constant tension of this lifestyle is clearly conveyed in Messner’s writing. The urgency of the text kept me reading page after page. I liked the brisk pace of the novel, because it carried the plot with an intensity appropriate for the stormy setting. The world that Messner creates inside and around Placid Meadows is striking because it is so plausible. 2053 is not that far into the future. Everybody reads off of DataSlates (which sound awfully similar to iPads) and paper books are a rarity, preserved in libraries. And our current weather patterns are clearly affected by climate change – can the severe storms of the book be a real possibility? I know that Messner’s imaginative mind conjured up this world of constant severe storms, but when I woke up to a raging hailstorm last night I could not help but wonder if it was more violent than the hailstorms of my childhood. I liked that in Messner’s vision of the future, citizens were much more observant of their electricity and water usage – although this conscientiousness was born from necessity and limited resources, not necessarily a voluntary environmental instinct. In the middle of this fraught future world is Jaden, a bright young camper at Eye of Tomorrow…whose dad just happens to be the head of StormSafe. Jaden is in Placid Meadows during an awkward summer with her dad and new stepmom. She is reluctant to be there, but she has to make the best of the situation and makes friends with some of the other Eye of Tomorrow campers. Jaden is extraordinarily smart, yet she doesn’t let her power to manipulate numbers and excel at science overshadow her empathy. She sees that people are being hurt by these horrific storms and uses her talents to pursue a way to change the problems in her world. Although there were times during the story when I wished Jaden were more decisive, I respect that Messner created a heroine who is imperfect. Jaden is Slatebreaking in a believable way. Girl readers can look at Jaden and see themselves. The Slatebreaking doesn’t stop with Jaden. Her friend Risha is a bit boy crazy, but she’s also a smart and assertive young woman. Jaden’s stepmother Mirielle is also a Slatebreaker. She’s an accomplished dancer who also has an inclination for theoretical science, and she has made the choice to stay at home and raise her new baby. Grandma Athena, the grandmother that Jaden has only heard about, also had Slatebreaking qualities – she pushed to be at the top of her field and dedicated herself to her research. Females who value knowledge and self-sufficiency are constantly influencing Jaden’s growth as a young woman. My favorite character, however, was a minor character who managed to have great impact on Jaden despite her small role in the story. Ms. Walpole is the librarian on the StormSafe Eye of Tomorrow campus, and she is a brilliant lady. She was one of the holdouts who did not want to sell her land to StormSafe, and although she did not get to keep her land she did insist that the StormSafe library include real paper books as well as a great many treasures. Although Ms. Walpole is part of the corporate StormSafe staff, she fights the overbearing nature of the company. Gotta love those feisty librarians. What I love about this book is that it blends scientific concepts with classic literary mystery elements, making it a teacher’s dream. An elementary school teacher could use Eye of the Storm in the classroom and build amazing cross-curricular connections, fulfilling the STEM emphasis goals while still teaching quality literature to students. And it’s not a gratuitous tie-in, either. Eye of the Storm is worthy of classroom study on its own. It’s a wonderful side benefit that it includes elements that will please those who insist on more science in the classroom. This entry was posted in Middle Grade, Reviews and tagged climate change, curriculum, girls and science, Kate Messner, Speculative Fiction, STEM, storms. Bookmark the permalink.